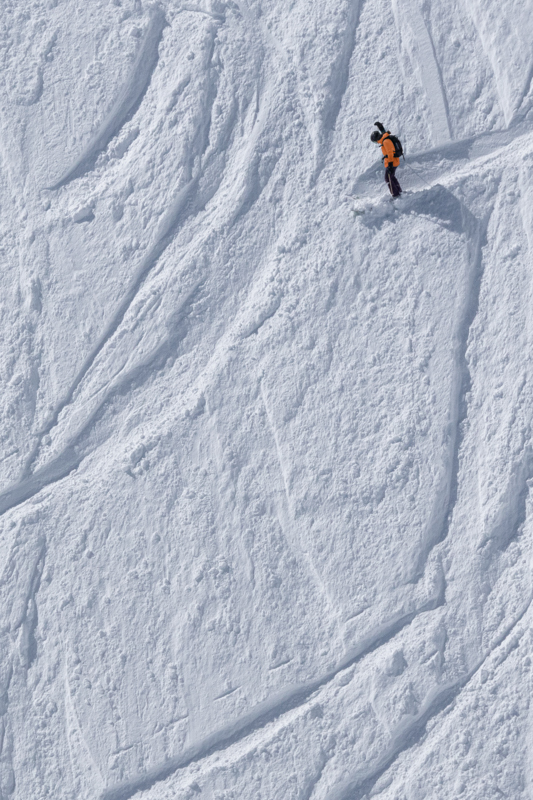 Highlands Bowl is where the experts ski, and even they have never seen aerial views like this. A bucket list item for many, Highlands Bowl is arguably the most intense skiing in all of North America. 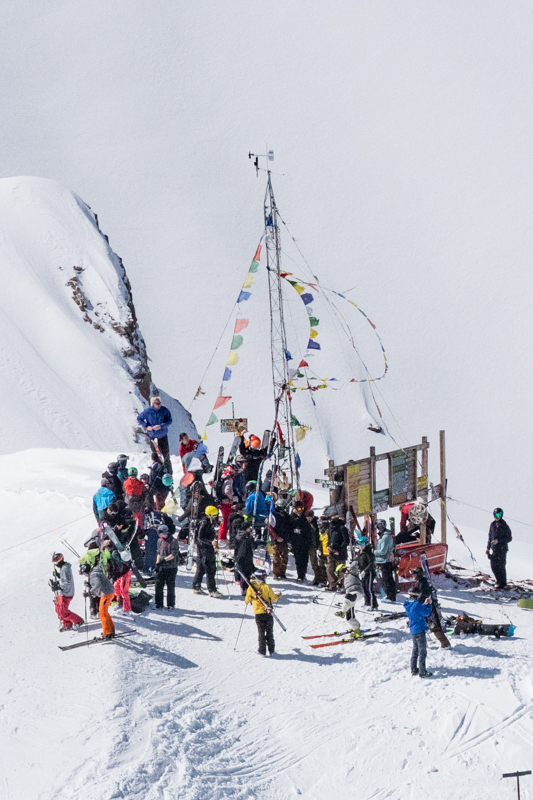 The summit, which is only accessible by foot, descends from a peak of 12,382 feet. What makes these images unique is the vantage point. There's simply no outcropping or higher peak anywhere around where you can really see what the climb to the ridge looks like. Even if you are one of these rare people who have the billy goat-style stamina required to make this 45 minute trek carrying skis, snowboard, and/or backpack, you still never really walk over any spot that will allow you to get these same views. The helicopter, on the other hand, changes everything and makes all of these views possible. What made this day spectacular was the fact that it was the third weekend of March, which historically has the most skiers in town and we had just had a big snowfall the previous week. So the conditions all came together on this crystal clear, snow bird Colorado day. They say every day is different on the mountains, and this was one of the most spectacular. We were very fortunate to record it. To see the full series, click over to the series page. 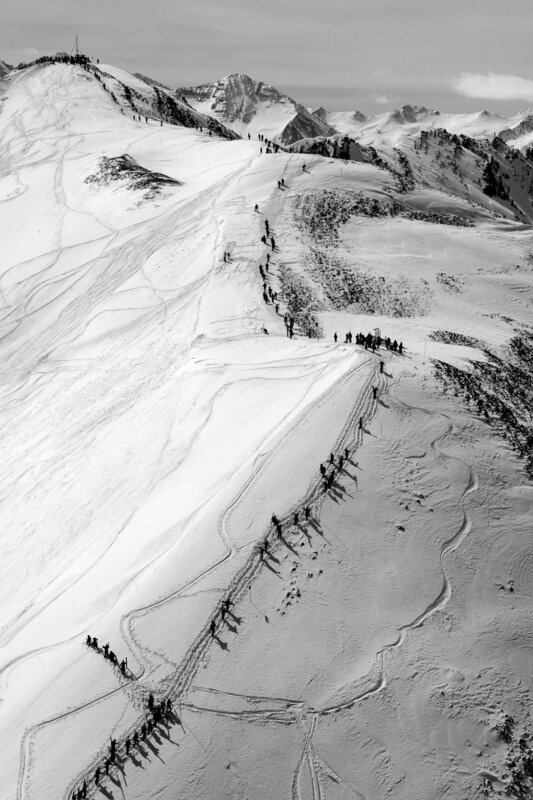 Since these images look spectacular in black and white, we also created a black and white Highland Bowl Series, which we call Highland Bowl B&W.